TENTPOLE is thrilled to welcome under The Big Top this week – Jeremy Epstein, CEO of Never Stop Marketing. Jeremy is a leading speaker and writer on blockchain-driven innovation from a marketing perspective. 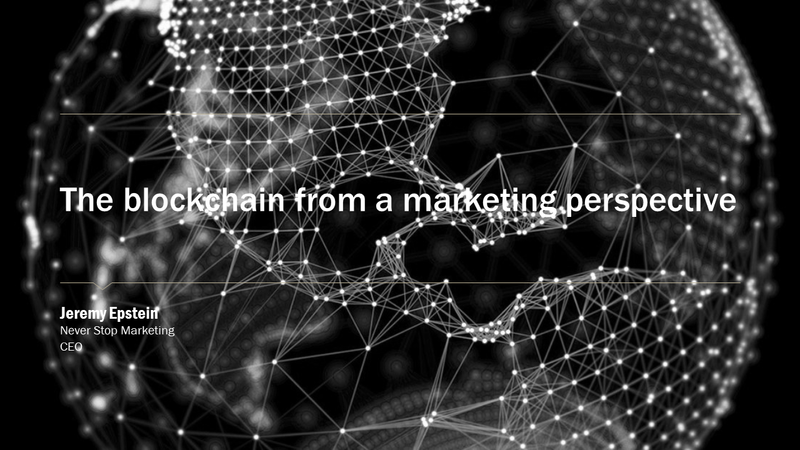 The marketing subject matter expert for the Blockchain Research Institute led by best-selling authors of the Blockchain Revolution, Don and Alex Tapscott. Co-founder of Crypto Explorers, a leading community for passionate individuals collaborating to understand the decentralized future. The group hosts quarterly gatherings called “Crypto Valley Trips” in Zug, Switzerland. Founding Director of the Blockchain Board, a brands-only, peer-to-peer networking group for the world’s largest enterprises seeking to understand use cases and implications of distributed ledger technology. A frequent contributor to Venture Beat, Bitcoin Magazine, and Distributed Magazine, as well as a regular guest on the Bitcoin Podcast and Cryptoverse. Jeremy has presented to hundreds of audiences in 15 countries, he blogs like a fiend and is bringing his latest talk under The Big Top. The Big Top is TENTPOLE’s weekly collaborative circus that heralds the art and science of convening people. It’s where we bring together our global community to engage in thoughtful, intentional collaboration to solve challenges and identify and explore opportunities across the live event industry. To learn more, or to join us on our journey, throw your hat into the ring.